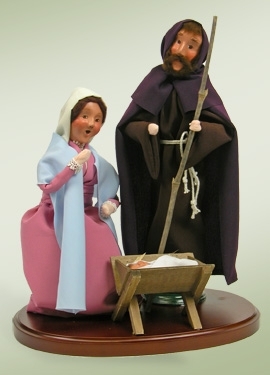 The Byers Choice Nativity Collection brings the true meaning of Christmas to life. One of the most popular Christmas Holy Family pieces is the Byers Choice Holy Family which comes with Mary and Joseph over Baby Jesus in the manger affixed to a commemorative wooden platform. This is a true Byers Choice masterpiece. All Byers Choice figurines are made in the USA in eastern Pennsylvania by over 50 skilled artisans. At Christmas Tree Hill, Byers Choice Caroler purchases over $50 ship free via ground shipping within the continental US. Use code BYERSSHIPSFREE at checkout. Byers Choice Carolers - "Holy Family"